Yesterday, I gave you my top tips for managing a run-of-the-mill cold, virus, or other seasonal bug. And the whole point of that post seemed to be my telling you to follow intuition about what to eat, and what not to eat: I mentioned that it’s really important not to force down foods that you’re not ready for. By the time yesterday night rolled around, I wasn’t quite yet ready for any sort of raw or even steamed green, but I did think I would be able to get a little green veg down if I could mix it into a comforting bowl of grains. This recipe—my easy green quinoa bowl—is the result. And in spite of the fact that it was ostensibly created as a way of getting over a little bug, I have a feeling it’s going to be one of my go-to grain dishes at home, because of its simplicity and outstanding nutrition. This isn’t the first dish I’ve made that features finely chopped greens in grains: it’s actually one of my favorite ways to prepare grains, and I’m pretty sure I should be sharing more of those recipes with you, my green-loving audience. It is, however, one of the more mild green/grain dishes I’ve prepared, as I went pretty easy on the kale (1 heaping, finely chopped cup). The dish was created to make you feel as though you’re eating grains, not greens, but if you’re eager to stuff more kale in here, it wouldn’t be hard. Likewise for the kelp, of which I used only a tbsp (that’s less than 1 tsp per serving): you can certainly increase the quantity. In spite of having not felt well in the last few days, the kelp didn’t turn me off at all, and I could easily have added more. Keep in mind, though, that sea vegetables are a major comfort food for me, which isn’t the case for everyone! Let’s talk nutrition! Not only is quinoa one of the higher protein grains, but it is also a complete protein, which simply means that it provides all of the essential amino acids we need from dietary sources in a single place. 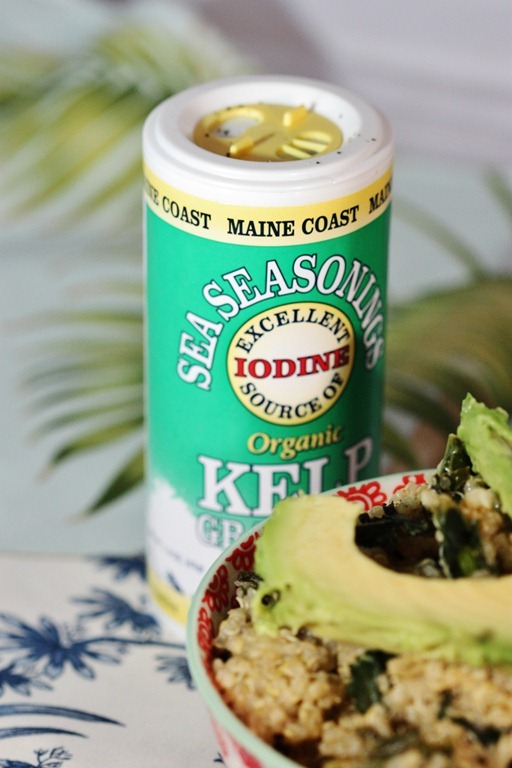 Nutritional yeast also adds protein (about 16 grams for the whole recipe), and the kelp provides iodine, an essential and oft-overlooked dietary nutrient that supports the thyroid, among other things. Many Americans have grown accustomed to getting iodine only through iodized salt (first created to help treat goiters, a symptom of iodine deficiency, in landlocked regions of the country). We forget that sea vegetables, in addition to being rich in countless vitamins and minerals, also provide rich stores of iodine. I try to add chopped sea veggies to as many salads as I can, and I’ve even been known to slip them into smoothies! 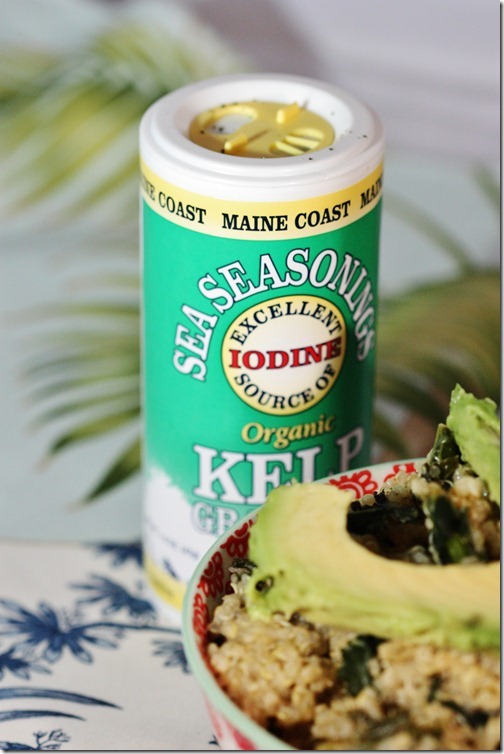 The kelp I used in this recipe was made by the great folks at Maine Coast Sea Vegetables, who sell kelp, dulse, nori, and other sea vegetables in granulated form. It’s a wonderful way to replace sodium in your diet, first of all—sea vegetables are salty, but much lower in salt that sea salt or regular sodium chloride—and also a good way to add nutrition to your food. I can’t recommend purchasing these little canisters enough!! 1) Rinse your quinoa in a sieve. Set the quinoa and water in a stovetop to boil, or add the water and quinoa to a rice cooker to begin cooking. 2) When the water boils, reduce to a simmer. Cook at a simmer with a lid on the pot, but slightly ajar, so that some air can escape, for about 20 minutes, or until the liquid has evaporated and the quinoa is getting plump and fluffy. Quinoa cooking times can vary, but 15-25 minutes is average. You know it’s done with the quinoa is nice and plump, and little “threads” have come loose in the grain. 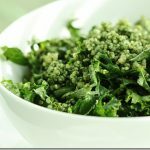 3) Stir in the kale, lemon, nutritional yeast, basil, sea vegetables, and the extra 2-3 tbsp water (or more if your quinoa is dry). Season to taste with salt and pepper. Serve warm, topped with some avocado slices for healthy fat and creaminess. And it’s ready in no time. Of course, this dish isn’t only for the convalescing! It’s great for anyone with a healthy palate who is hoping to squeeze in more green vegetables and sea vegetables. Or for anyone who appreciates the magical flavor combination of nutritional yeast, lemon, and basil. With that, it’s time to get back to the books. I’m hoping to take a restorative yoga class today as a study break at Yoga District—anyone a fan? Quinoa + kale= Awesomeness! How can you go wrong when you combine these two super foods? I cant wait to try it. Thanks Gena! First of all, glad you’re feeling a bit better. Second, yum! 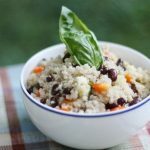 I actually find quinoa to be too light of a grain for me in terms of texture and satiety, so I usually swap it out for brown rice. However, add avocado to anything and I’m a happy gal. I totally agree but feel like its a bit taboo to say I’m not a quinoa fan. But it NEVER fills me up! I know what you mean — if grains are the centerpiece of my meal, and I’m not eating them with a lot of other stuff, I often choose rice or millet instead. That said, in this case, quinoa was just about the right heft for my still shaky system. To Hannah, below, there’s nothing taboo about it! Nutritional yeast, lemon, and basil sounds like a good food pairing when you’re feeling under the weather…or anytime. And I hope you’re on the mend, Gena! I am a long time reader, but never really comment, I love your blog! I live in Northern Virginia and wanted to let you know you should definitely try Dancing Mind Yoga, It is an AMAZING studio! Its in falls church VA, which may be a pain for you, but wanted to let you know its out there 🙂 I’ve never been to yoga district, but will love to hear what you think! What perfect timing for you to be offering advice and recipes for when we find ourselves ill. I was diagnosed with Mono last week and while I thought I’d sneak through it it hit with full effect on Wednesday and I’ve been having to be pretty creative in order to find healthy , natural and tasty things to nourish my body with. Now that I have a bit more energy I think I’m going to go on a bit of a “fieldtrip” and pick the stuff i need for this dish! It looks perfectly up my alley and right in line with my noshing capabilities. Thanks for all your awesome advice, being sick can be an extra nightmare for those of us that prefer a more natural lifestyle – our only options are medicated candies and frozen sugary treats…. very hard to avoid when defenses are down more than normal. Woo hoo! Thanks for the shout out to sea veggies! They are so good for you and really tasty! 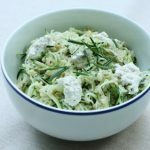 I sprinkle kelp on salads and grains, spirulina in smoothies, and eat nori chips and rolls and chlorella tabs, but would love if you could share more ways to eat them. As always, thanks for the great post! Looks great! 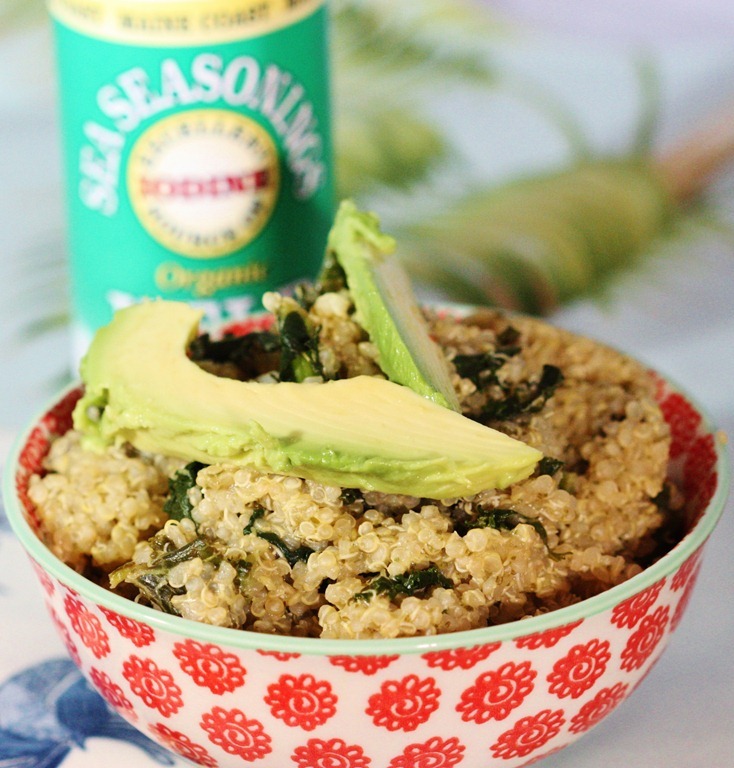 I love quinoa with a citrus dressing and quinoa and avocado make a perfect combination of textures for me. I have yet to try sea vegetables (minus seaweed salad, which is a favorite). Do you have any seaweed salad recipes? I would love to learn how to make a homemade version. Hope you are feeling better! Good luck with your exam tomorrow, Gena, and enjoy that yoga class! Sea veggies are a comfort food to me too! In your last post I mentioned a bowl of miso broth with sea veggies is so comforting to me. I love Maine Sea Coast sea veggies, they are probably the only kind I use. 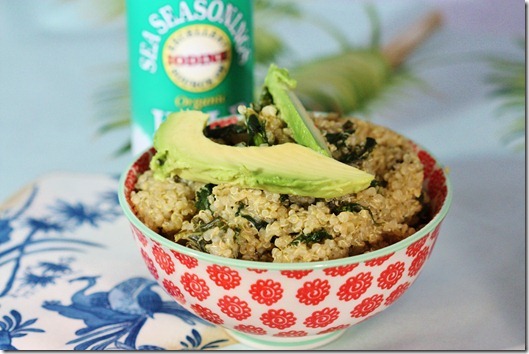 Great idea for a quinoa dish. When I was first getting into eating darker leafy greens, we surely used them in this way more often, chopped up into some grains or beans. I also love your red and white bowl. So cute. simple quinoa bowls are amongst my favourites. i usually take a quinoa concoction for lunch with me to the office. and my by far favourite recipe is quinoa, 1 T pesto, broccoli, edamame extra basil and avocado!! so good! I have been making a similar combination of my own all week long for lunch. I use veg stock instead of water and toss in extra veggies (steamed broccoli, chopped asparagus, cherry tomatoes) at the end. I have started making a really yummy sauce using garlic hummus, water, nutritional yeast, mustard powder, and cracked pepper. I stir them all together and gently warm up then drizzle on my finished bowl. So yummy and creamy especially with the avocado! That looks amazing. My husband isn’t into greens, but maybe he’d go for this. It’s worth a shot! 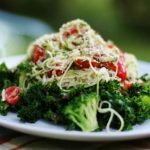 Wow this looks great – I’ve been meaning to incorporate kelp into our diets so will definitely check out your link! I am glad you are well on your way to being back to normal, and I think your restorative yoga class is an AMAZING idea. Just what you body needs right now! I think this recipe looks amazing too. Hmm looks so good. 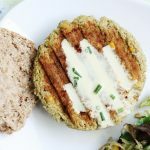 I made this same dish for dinner except I used millet (I still haven’t gotten used to the little tails on the quinoa) and added some zucchini and green bell peppers. Yum! I definitely need to start trying to incorporate sea vegetables like you do though. As I cooked up a big batch of quinoa last night I found myself daydreaming about a really similar dish! I am going to make this tonight with added curry powder and dulse (I have the same brand of dulse, no kelp on hand). And the addition of nutritional yeast is genius. Love your recipes Gena, thanks for sharing! 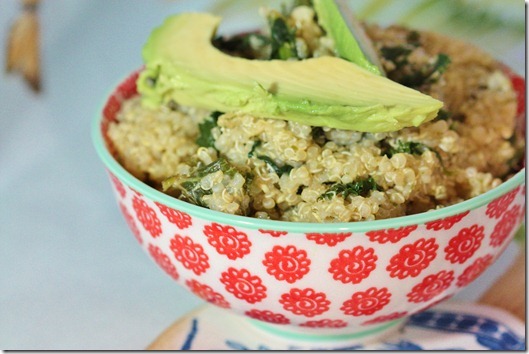 Have you ever substituted the water for broth when cooking the quinoa? I need some more quinoa recipes because I hardly ever use it. This one looks great! Turned out incredibly delicious! Even my 1 1/2 year old ate it! Thanks for posting this! I will have to pick up one of those canisters of seaweed. I never thought of using it to replace table salt, but I think I would prefer it in many of my quinoa dishes. This quinoa dish looks great. I’m going to get some kelp granules the next time I’m at the co-op — I love seaweed, and am always looking for ways to lower my salt intake.